Last November, the United Nations Secretary-General Ban Ki-Moon called for a report on Innovation and Access to Health Technology, and set a High-Level Panel to do this. This report came out in September 2016, entitled “Promoting Innovation and Access to Health Technology”. 1. Health technology, innovation and access: Reviews the current global situation, and identifies multiple barriers to access. There are evident conflicts (“incoherences”) between need for improved access versus commercial and intellectual property incentives. 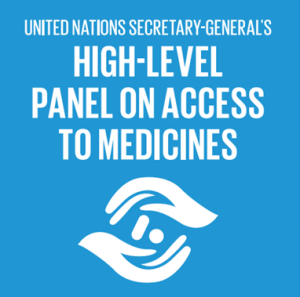 Highlights the importance of the WHO Essential Medicines List (EML) for access. 2. Intellectual property law and access to health technologies: Explains how intellectual property (IP) law, World Trade Organisation (WTO) and TRIPS considerations work in health technology. Discusses public funding of research and development (R&D). 3. New incentives for research and development of health technologies: Presents possible new ways to promote R&D, e.g. in neglected diseases and antimicrobial resistance, using incentives and disincentives (Pull and Push). The market-based model is not working for these areas. 4. Governance. Accountability and transparency: Looks at how rules governing trade/IP can conflict with public health/human rights because of differing regulatory, accountability and transparency mechanisms. Discusses how coordination and integration may help overcome the incoherences. • WHAT ARE THE CONCLUSIONS/RECOMMENDATIONS? Overall, the Report identifies ways to improve access to health technologies. Briefly these include setting up taskforces to study how an overarching approach might improve integration and coordination; other proposals include greater transparency of costs (for pricing), clinical trial results, governments taking responsibility to meet the health needs of their populations including spending more on health based R&D and new incentives for neglected areas, more transparent patent information, and need for publically funded R&D to disclose total data for the benefit of all. • WHAT DOES IT MEAN FOR GAFFI AND ‘96-95 by 2025’? • The report makes very clear the conflict/”incoherence” between Trade and IP versus health access. This is important to understand. Access to antifungal medicines for all is the aim, and the WHO Essential Medicines List is key. GAFFI’s aim to get generic antifungal drugs onto national formularies, and onto the WHO EML is therefore an important way to improve access. • A major concern would be about the bureaucracy and red tape of adding more Agencies/Codes of Principles/Policies • In summary it highlights the significance of the WHO EML and underlines the importance of GAFFI’s aims to get antifungals onto it.